Squee! Getting so close to the end! Today’s challenge is ‘inspired by a flag’. Now I dunno about other polish fiends, but since the Olympics resulted in an outright explosion of flag-and-other-patriotic manis, I became a little bit sick of them. I wanted to do something a little different, and as MaSucree said, “A lot more unique!” than a lot of the other flag manis out there. 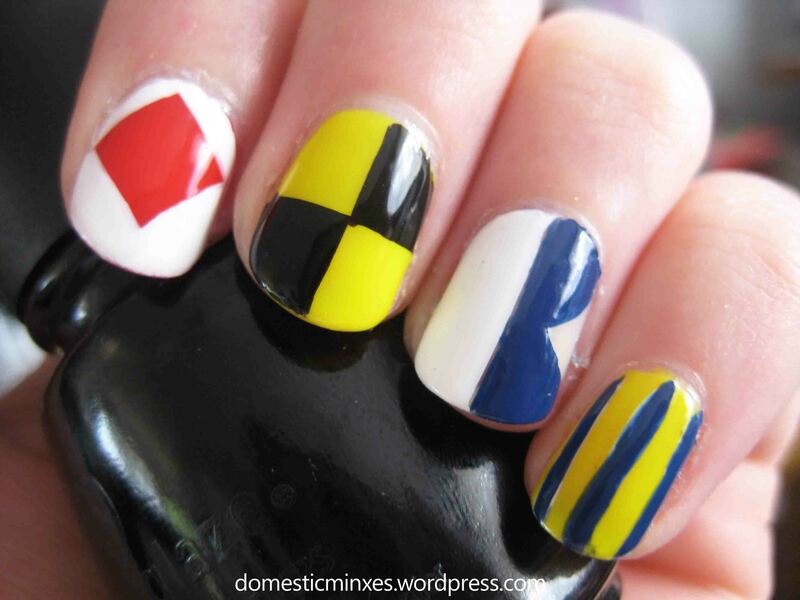 I decided to spell out ‘flag’ in nautical signal flags! I still think this was a fun one to do, and I’m happy that I came up with something a little different 😀 I got the inspiration from another Studio Ghibli film, Kokuriko-zaka Kara, or From Up on Poppy Hill. The main character raises signal flags every morning in memory of her father. I like the checker the most with the black and yellow!!! Same that one was definitely my fave! !